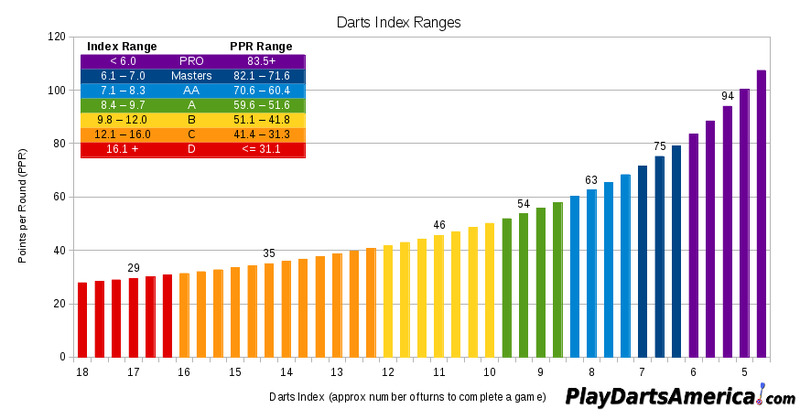 One of more basic questions any new darter asks is "how good am I?" and "what league should I be in?". These are good questions and usually there isn't a concrete way of answering other than "well, join a team and see where you are at". I don't like this method. Here at Bay Area Darts, we want players to play competitive matches against players of similar skill level, so we test players to see where they are at. Now, how do you go about getting all of these numbers?? We play 501 almost exclusively in league. This is the international standard for darts games. The result generated here is close, but will become more accurate within a few weeks. We're using it as a guide for initial placement into a league. Masters = Premier, AA = 1, A = 2, B = 3, C = 4, D = 5. E players can also play with the Division 4 players.